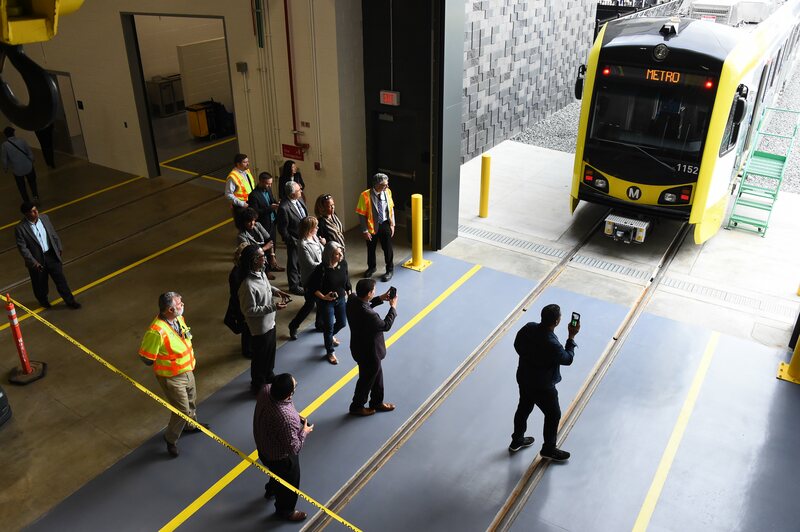 Art of Transit: Below are a few more pics taken last week at Metro’s new Southwestern Yard, where light rail cars to be used on the Crenshaw/LAX Line and Green Line will be maintained. The facility is adjacent to LAX. 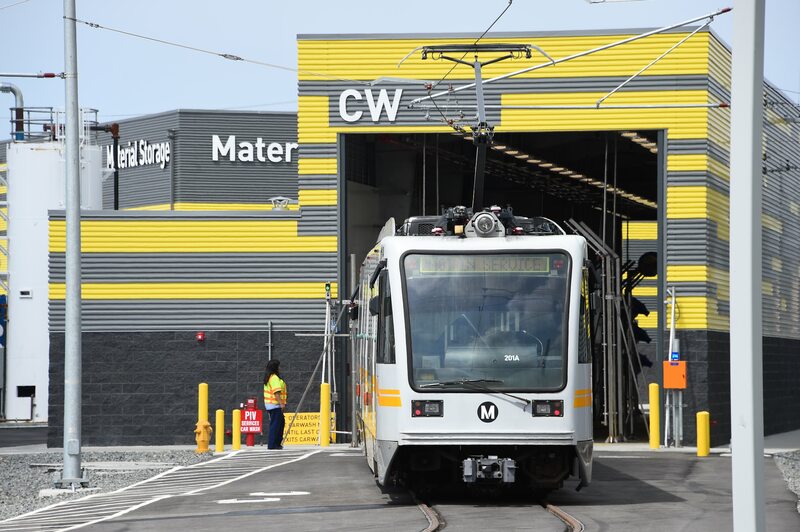 The grand opening of the yard was held Thursday and the Crenshaw/LAX Line will be opening next year. There was a good article in the LAT on Sunday about one of Metro’s most pressing safety projects: raising the concrete barriers along the 210 freeway to prevent big rigs and other vehicles from crashing onto the Gold Line tracks. In the last decade there have been 11 such crashes along the six mile stretch of the 210 where the Gold Line runs in the freeway median — 10 involving trucks and one a car. 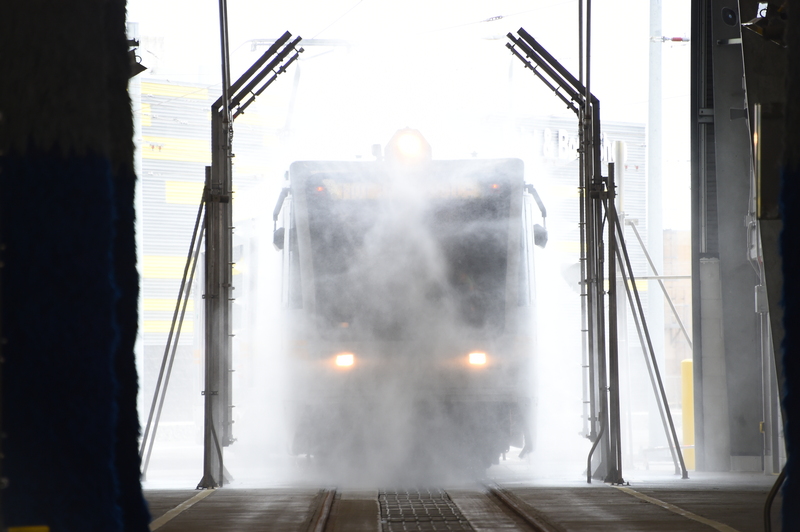 And none thankfully involving Gold Line trains or passengers. Metro has been working on designing a project to raise the barriers from a little less than three feet to four feet, eight inches. The new barriers would also be designed to better absorb impact and keep vehicles on the freeway. The Metro Board this month will consider increasing the design budget of the project — an item that got carrier over from March due to absences and conflicts-of-interests (the Metro staff report is posted below). 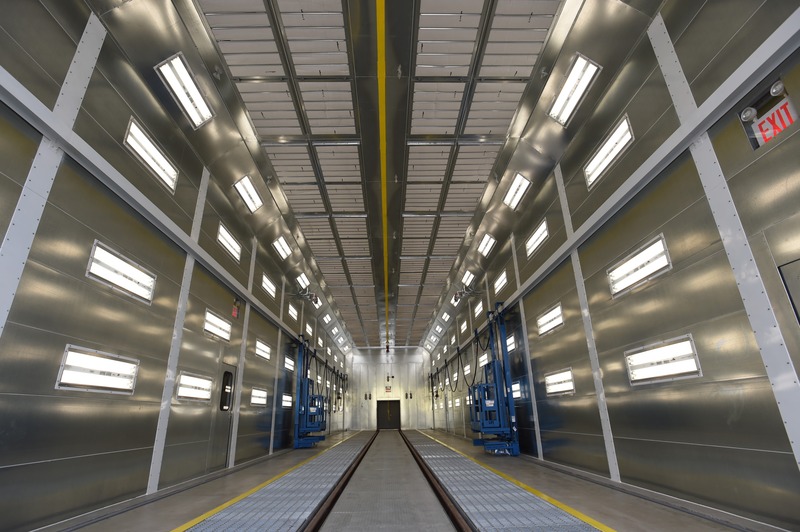 In the last 15 years, trucks have become taller and heavier, and the angle and height of the barriers are less effective at repelling speeding vehicles, [Metro Executive Engineering Officer Androush] Danielians said. The big challenge with this project is there is very little space to do the work of raising the barriers — the HOV lanes on the freeway are close to the tracks. Looking eastbound on the 210 in Arcadia. Photo: LA Metro. A Gold Line train on the bend in the 210 west of Sierra Madre Villa Station in Pasadena. Photo: LA Metro. For the majority of the project limits, the tight spatial constraint of the project site will require the closure of the HOV lane on the I-210 freeway and single tracking of the Gold Line during the removal and replacement of the existing median barrier. Construction dates are not yet set. 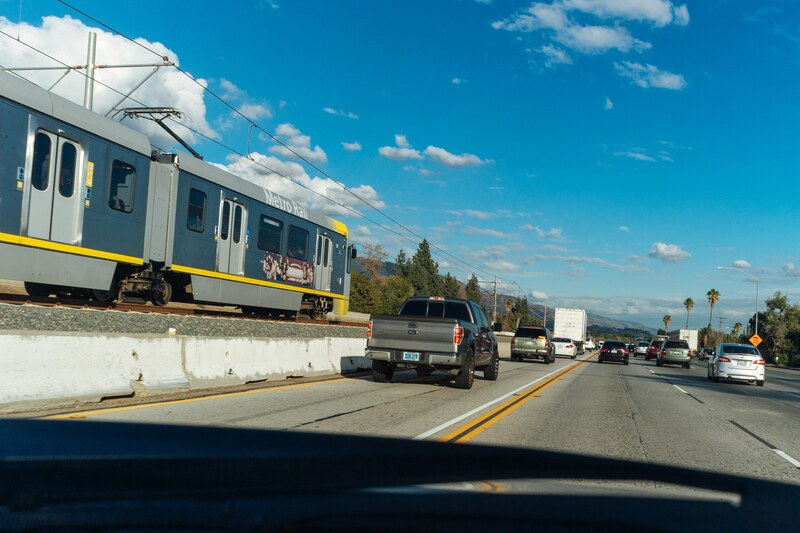 The project will be broken into two phases — from the Michillinda Avenue overpass in Pasadena to the Gold Line bridge in Arcadia that takes the tracks from the 210 median to south of the freeway. The second phase will be the stretch of freeway in Pasadena from west of Lake Avenue to Michillinda. 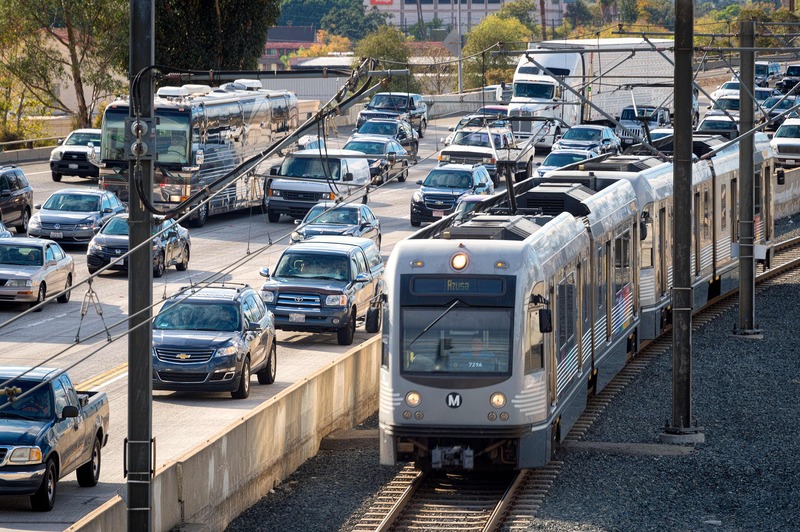 As the LAT notes, one of the stranger things about this issue is the fact that the Green Line runs for about 17 miles down the middle of the heavily-trafficked 105 freeway and a truck has never crashed onto the Green Line tracks. The 105, however, is straighter and has a larger buffer between traffic lanes and the rail tracks and a taller barrier with fencing. The 210 through Pasadena has the big curve west of Sierra Madre Villa plus many entrances and exits that leads to a lot of weaving — I live nearby and know this stretch fairly well. The westbound side of the 210 through Pasadena frequently backs up — not just during peak hours — before the 134/210 interchange as traffic trying to exit to continue on the 210 must compete with vehicles trying to enter and exit the freeway. I have no idea if that has anything to do with the crashes involving the Gold Line tracks. But it sure makes the 210 a tough drive. Here’s the Metro staff report on the project that went to the Board last month. •HBO is moving its West Coast headquarters to the new Ivy Station development rising next to the Expo Line’s Culver City Station. As Curbed LA notes, Apple and Amazon are also setting up their entertainment offices in C.C., making it a tech and entertainment hub. Sony and the NFL Network are already in C.C. Google announced last year it’s moving into the Westside Pavilion that’s a short walk from the Expo Line’s Westwood/Rancho Park Station. •As if LAX isn’t busy enough — that’s where the airlines want to fly — the airport is planning a new Terminal 9 east of Sepulveda Boulevard, reports the LAT. How to get there? The people mover would stop there. The new terminal looks nice but here’s hoping Terminals 2 and 3 actually one day have enough seats to serve the crush of passengers. When it’s busy in T3, and it’s always busy in T3, there are bodies sprawled every which way on the floor. It makes sitting in steerage class on the airplane not so bad! •Things to watch whilst transiting: Oh my, Mr. Puig. I’d appreciate the enthusiasm more if it was your home run that sparked the bad feelings between the Reds and Bucs. Thus far in 2019, Puig is hitting .133 — he hit .267 last season with the Dodgers — with no dingers. Sure, Cincy is a very different cup of tea than L.A., to put it gently. BTW, the Reds visit L.A. and the Dodger Stadium Express next week, a matchup that at present moment looks a bit lopsided. (Off topic) I noticed in the picture with the Siemens P2000, the fire alarm on the wall. You guys still haven’t switched from the SpectrAlert Advance to the System Sensor L-Series? While we are raising the barriers on the 210 to keep the trucks out, can we put higher, sound reducing walls (and for station safety as well, at Lake, Allen and Sierra Madre Villa to cut down on the unbearable noise? Please. Then go do the same on the Green Line Stations. Way overdue. From which street(s) will the Southwestern Yard be accessible? Right now my main concern is traffic/parking within LAX. In terminals 3 and 4 they are diverting traffic exiting the parking structures back into the flow of gridlock traffic instead of taking the middle road that terminals 1, 2, 5, 6 and 7 use. Who thought of this bad idea??? Steve, any idea what will be the fate of 9723 Aviation Blvd? It’s certainly a rundown building now, but it might make a cool bar like Oriel under Chinatown’s Gold Line tracks. 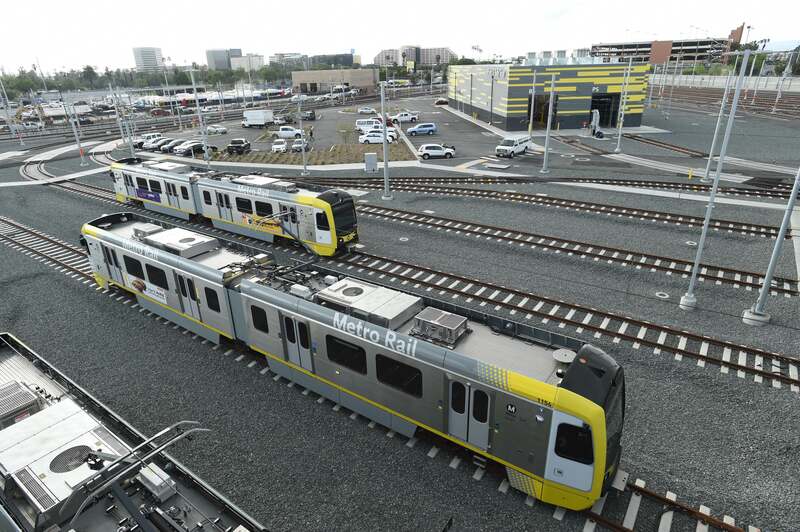 Is it correct the Southwestern Yard will service both the Crenshaw & Green lines? If so, then the current Green line yard on Aviation can go condo. I notice that in the Metro Airport Connector rendering, the station is very busy with people rushing about … but nobody has any luggage. Not even a carry-on. Odd, considering it’s so near the airport.